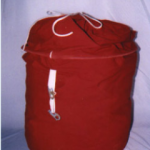 Turtleroo is a uniquely designed spinnaker turtle bag, which is made especially for stowing your sail and Chutescoop or any other spinnaker control device. It features a wide mouth bag having a split drawstring top. The top folds back to reveal one or three spacious interior pockets to hold Chutescoop and sail lines. 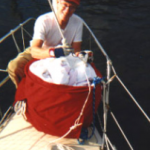 Turtleroo is the ultimate in organization for ship shape storing.